L9-90 CLUB Heavy-Duty Commercial Treadmills - The L9 90 Club is a full commercial rated treadmill made for heavy-duty all day use in dues paying facilities. With a 500 lb. weight capacity and 22" x 63" running deck surface, it can handle users of all weights and stride lengths. The 4 HP continuous duty motor is paramount in providing consistent all day use for maximum power without the risk of motor burn out. Further protecting the motor and electronics from the day to day pounding is the massive, 14-lb. high inertia fly wheel that is significantly larger than most competitors. The Landice cast flywheel is engineered to simulate the inertia of a 42-pound solid flywheel but with the benefit of placing only 14 pounds of pressure on the motor shaft and bearings of the motor. Made In The USA! Landice is a second generation family owned business located in Randolph, NJ. They have been engineering and manufacturing treadmills in the United States since 1967. While a lot of treadmill companies now source their manufacturing offshore, Landice continues to manufacture more than 95% of their treadmill parts right here in the United States. This insures consistent quality on all Landice light commercial and full commercial treads purchased. 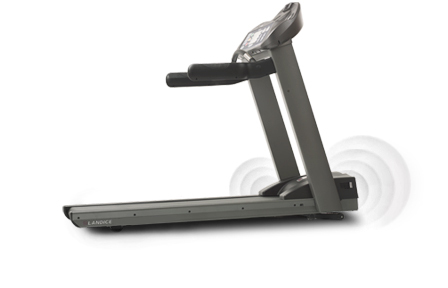 When you purchase a Landice, you can be assured that it is the same quality as treadmills found in leading health clubs all over the world. What are the warranty differences between Landice LTD and CLUB treadmills? Landice Heavy-Duty Commercial Grade Treadmill for State or Federal Government - All Landice L9-90 CLUB treadmills can be purchased from IRON COMPANY® on GSA Contract GS-07F-0104M and CMAS Contract 4-12-78-0066A. Need treadmill mats, elliptical trainers or exercise bikes to be consolidated with your treadmill shipment? IRON COMPANY® can provide quick quote turnarounds and order fulfillment with any combination of equipment needed. Need multiple treadmills for a health club or university student rec center? Call an IRON COMPANY® club equipment specialist today at 1-888-758-7527. Use only 20 AMP dedicated circuit. All electrical motors and components emit electrical "noise" due to electrical/magnetic fields. The Landice Isolation Leakage Kits help lower this electrical noise below 300 micro amps to better reduce interference with other cardio equipment, heart rate monitoring systems, or wireless entertainment systems that may be near the fitness unit. This option is covered under the Landice Commercial Warranty. All Landice Treadmills = Freight cost included within the lower 48 states only.